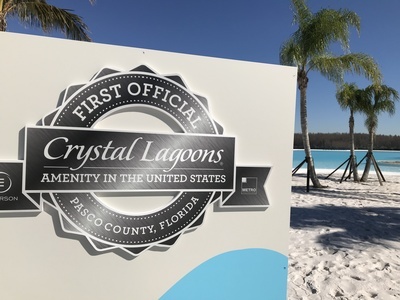 The new 7.5 acre crystal-clear lagoon will bring the beach to Wesley Chapel. “We finally get to see this water, how blue and clear it is. And how everyone is enjoying it even though it’s a little cold out here today,” said Crystal Lagoons regional director Christopher Souza. 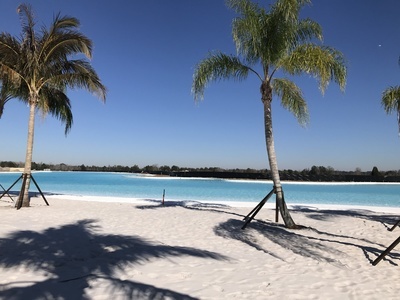 The Crystal Lagoon is a man-made lake surrounded by sand and palm trees. And it’s the main amenity for the new Epperson community. There are plans to build 2000 homes in the development just north of State Road 54. “Our thought process was, everything else being equal somebody is going to choose living here other than another community down the road. Tampa is a competitive market. So how do we differentiate ourselves,” said Metro Development Group president Greg Singleton. Until now you could only find these man-made lagoons in other countries like Egypt, Dubai, Uruguay, and Brazil. But Wesley Chapel will be home for the first one in the United States. Crews just finished filling it up with 16 million gallons of purified water. It will include a swim-up bar, cabanas, tidal pool, and family beach. But that’s just the beginning for the Tampa Bay area. A similar lagoon is under construction in Southern Hillsborough County. And another new Wesley Chapel community will have one too. “You get beach life. You get family life in your backyard. You spend time with your family out here in the outdoors. It’s a sustainable healthy lifestyle,” said Souza. Developers say the concept is paying off, with hundreds of homes already under contact. “Sales have been twice what we thought they would be. And we had aggressive goals to begin with,” said Singleton. We probably won’t need heavy coats for the grand opening here in the spring. Olympic superstar Michael Phelps will be coming to Crystal Lagoon for the grand opening. The swimmer is the company’s global ambassador.